Dow Jones Industrial Average titan Boeing (NYSE:BA) is rapidly losing altitude, down as much as 18% from its recent high this morning, as investors worry that another crash of its 737 MAX 800 could signal a serious safety deficiency that could ground the plane. Already, Chinese authorities have stopped flights on the jet after an Ethiopian Air flight went down under similar circumstances to a Lion Air back in October. The 737 is a cash cow for Boeing, and these crashes risk undermining confidence in the airframe as well as Boeing’s deep order book. Not to mention the risk of litigation if the crashes were proved to be caused by a design flaw. 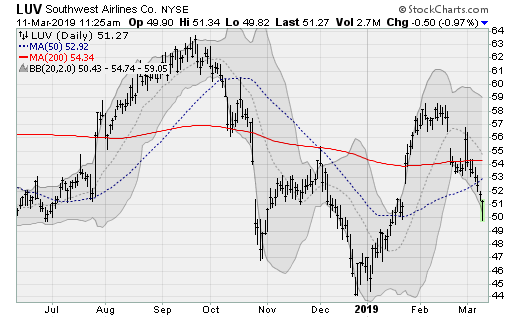 Last week, I warned about troubled airline stocks to sell, including Southwest Airlines (NYSE:LUV), as demand and overcapacity concerns have taken their toll on the stock. However, the 787 MAX issues have hit LUV stock particularly hard as the company is the largest U.S. operators of the design. Any FAA mandated grounding would cause havoc in the company’s flight plans risking cancellations, delays and lost business. The company will next report results on April 25 before the bell. Analysts are looking for earnings of 88 cents per share on revenues of $5.3 billion. When the company last reported on Jan. 24, earnings of $1.17 per share beat estimates by 9 cents on an 8.5% rise in revenues. 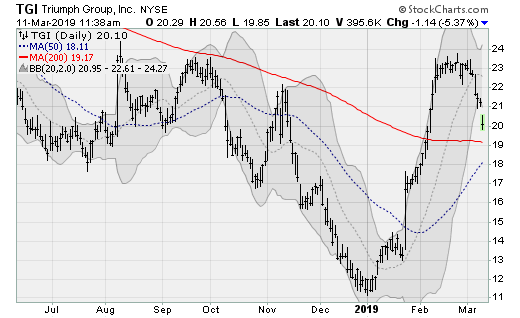 Shares of composites manufacturer and Boeing supplier Hexcel (NYSE:HXL) are moving sharply lower, threatening to fall back under both their 50-day and 200-day moving averages. This risks unwinding much of the 35%+ rally off of the late December low. Analysts at Loop Capital recently downgraded their rating. The company will next report results on April 24 after the close. Analysts are looking for earnings of 79 cents per share on revenues of $590.9 million. When the company last reported on Jan. 23, earnings of 82 cents per share beat estimates by 2 cents on a 9.6% rise in revenues. 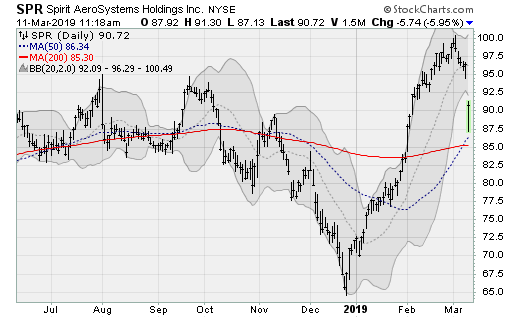 Boeing supplier Spirit AeroSystems (NYSE:SPR) is down nearly 6% in trading this morning, rolling away from an impressive 70% rally off of its December low and risking yet another test of its 200-day moving average. This returns prices to the middle of a three-year-long consolidation range for the maker of aircraft components such as fuselage sections and wings. SPR stock was recently downgraded to Neutral by analysts at Seaport Global Securities. The company will next report results on May 3 before the bell. Analysts are looking for earnings of $1.69 per share on revenues of $1.93 billion. When the company last reported on Feb. 1, earnings of $1.85 beat estimates by 7 cents on a 7% rise in revenues. 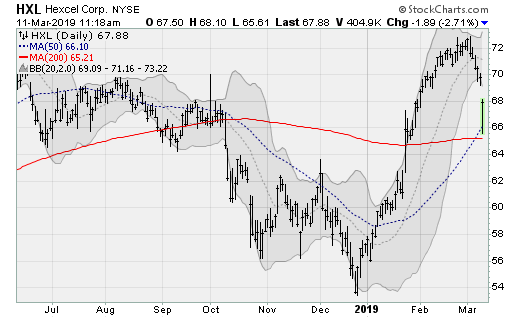 Aircraft parts maker Triumph Group (NYSE:TGI) is, like the other parts names here, rolling lower from recent highs and headed for a test of its 200-day moving average. Shares enjoyed a doubling from their early January low but have now returned to the center of a consolidation range going back to early 2016. The company will next report results on May 9 before the bell. Analysts are looking for earnings of 56 cents per share on revenues of $831.47 million. When the company last reported on Feb. 7, earnings of 42 cents per share matched estimates on a 4.2% rise in revenues. The post 4 Other Stocks to Sell As Boeing Tumbles appeared first on InvestorPlace.